Messengers are one of the most used applications on smartphones now and these applications have serious competition at every region of the world. WhatsApp is one of popular applications for iOS and Android at the moment. We will have a guide on this page for sending a video to your friends. Actually this is very similar with sending photos on the app. If you have any problem with sending video on WhatsApp, please click here for solutions. You can also ask any question about the application at the comment section below. You can see the comment section swipe/scroll down of this content. Run WhatsApp Messenger on your iPhone or iPad. Open a chat window with your friend who will receive the video. Tap on “+” on the chat screen like we have shown at the picture below. Tap on Camera or Photo & Video Library from the menu. If you select the Camera, tap on shutter button and hold it. 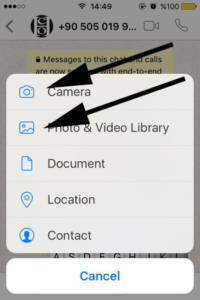 That’s how you will record video for WhatsApp on iOS. If you select Photo & Library select a video from the gallery. Tap on blue arrow icon and send it to your friend. 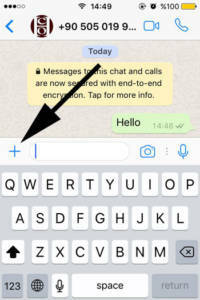 This is how you can send video on WhatsApp iOS. You can see how to send it through Android below. Open the chat on the application. Tap on the attachment icon that we have shown you above. Select Gallery or Camera from the menu that will appear after you tap on attachment. Gallery is for existing video on your device, camera is for recording video simultaneously and send it. When you are done with recording video on your camera or selecting a video on your gallery. Tap on green arrow to send it. That’s all, now you can send your video to your friend. Please don’t hesitate to ask questions. 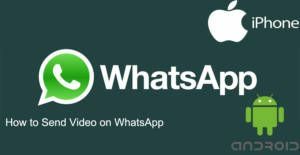 We will response your questions about sending videos on WhatsApp on iOS or Android.